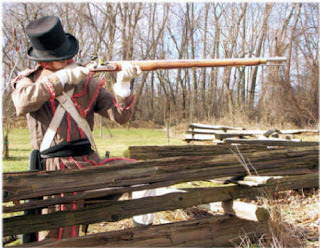 As today is the annniversary of the attack on Fort Recovery by Blue Jacket during the Northwest Territory War I thought I'd post this film of the reconstruction of the fort in Ohio with some of the exhibits. One of the drawbacks of a lot of F&I ranges tend to be the irregulars - usually the designer has some misplaced idea about coureurs de bois that look like Davey Crockett so it's particularly reassuring to see these Miliciens from Galloping Major looking spot on and in good poses too. Weaponry all correct - I am looking forward to seeing more of what promises to be a range to collect. A film that still divides opinion. Shot in England this film was a disaster for all involved...but I still like it and enjoy this sequence. 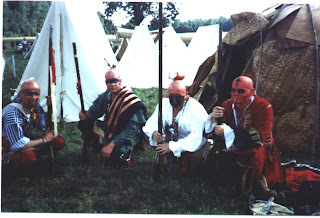 Been chatting recently with Mike Reynolds about old times, reenactment and so on. 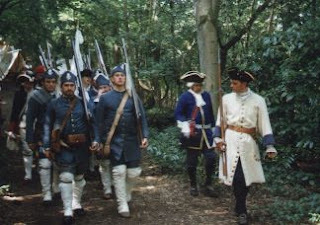 Mike was, with Robin Golden-Hann, the UK's first Iroquois reenactors and to prove it here's a photo of him and Robin at Audley End with the Royal Yorkers who came over with a host of US and Canadian Revolution reenactors to Britain in 1987. 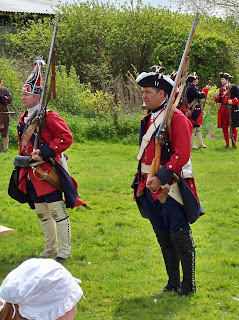 A few British revwar types went to take part but sadly only a very few were allowed on the field. Must have been quite an experience. 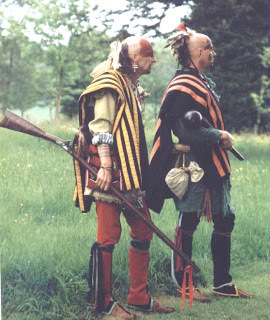 Paul and Dave recreating British-allied Mohawks at Wrest Park - last century. 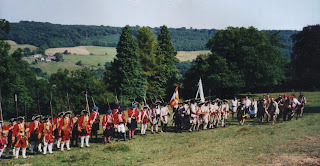 Reenactments of the French and Indian war at Bath American Museum and Kirby Hall from the end of the last century. 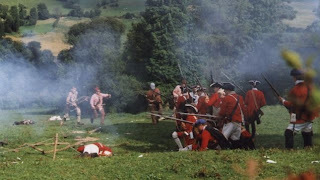 Clip from the PBS documentary series The War that Made America showing the famous Braddock defeat in 1755. 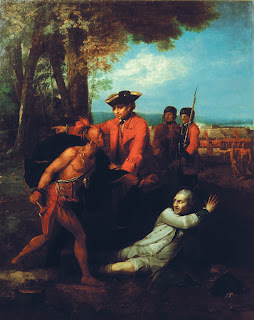 Barszo certainly are leaders in the field of 1/32 frontier figures - here is their latest releases - Cherokees. 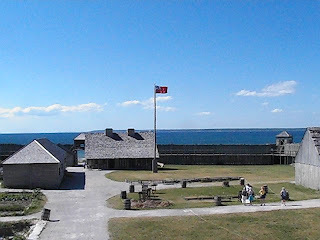 This website is one of my favourite battle sites for the War of 1812. 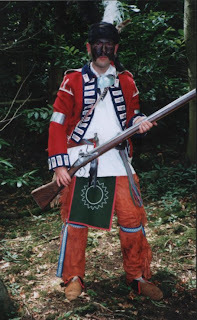 Lots of really interesting information and photographs like this one of a Kentucky Militiaman and an article on the clothing of the Militia at the battle. 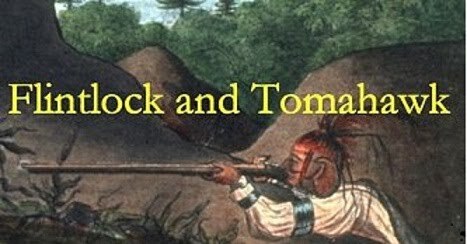 This might seem a slightly irrelevant conflict as far as Europe is concerned - say 1812 over here and people think of Napoleon and so on but obviously in American and Canadian history circles this is a significant date and one that will hopefully see the period get a higher profile. Website of the bicentennial here. This pic from 97 at the American Museum I like. I'm the fellow in the white. This new range of 28mm figures are impressive. The sculptor obviously knows the period's 'material culture' well as they all have appropriate weapons like the fusil de chasse carried by the new Canadian Militia figs. Noone has really done decent Miliciens up til now and these are the best I've seen - see the greens on the studio page of the website. 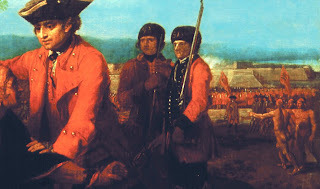 Figures in the background are thought to be 60th Royal Americans - though they weren't present at the Battle of Lake George. It looks like they have the GR cypher on their caps. 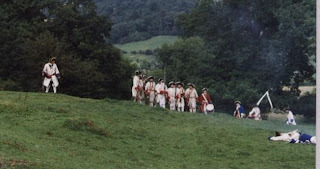 The figure on the left is wearing a red waistcoat - could he be one of Gage's Regiment? 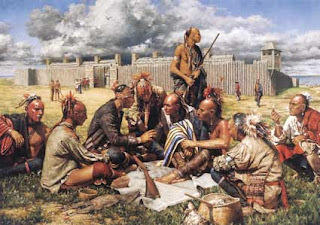 Artwork The Conspiracy - Fort Michilimackinac by Robert Griffing. Print available from here.